If you think you love your Instant Pot now, just wait until you get your hands on the Tecvinci 12-Piece Accessory Set for Instant Pots. You’ll get a ton of great new features on top of all the different cooking modes that are already supported by your favorite multi-use cooker. 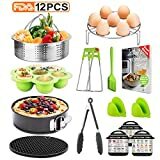 Cook eggs in the egg rack, steam vegetables in the stainless steel steamer basket, make bite size morsels of just about anything in the egg bites mold, and more. Trust us, it’ll be the best $39 you’ve ever spent. OFFERS HEALTHIER COOKING METHODS -Steaming is one of the best cooking methods that remains 90% nutrient compared to frying and grilling. You can cook a variety of foods with our product ranging from seafood, vegetables, eggs, meat and baby food among others. Most favorable in reheating food without loss of the original nutrients or flavor as compared to microwave. FITS 5, 6 & 8 QT INSTANT POT AND OTHER BRAND PRESSURE COOKER：this set is compatible with most instant pot models including IP-DUO50, IP-DUO60, IP-LUX60 and IP-DUO80. It also fits other multi quarts (6 quarts and above) electric pressure cookers such as Kuhn Rikon, Power XL, Cuisinart, Fagor, Costaway, Faberware, T-fal, Elite, GoWise, Secura and Gourmia.